One of the biggest project hurdles we face is the logistics of scheduling photo shoots with participants. The truth be told, people involved in open source are busy and in high demand! When you combine that fact with my schedule, it’s not uncommon for it to sometimes take months (or even years) to schedule portrait sittings. Luckily, a lot of participants are based in, or travel to, Silicon Valley and New York City where I can often find a time to bring them into the studio. 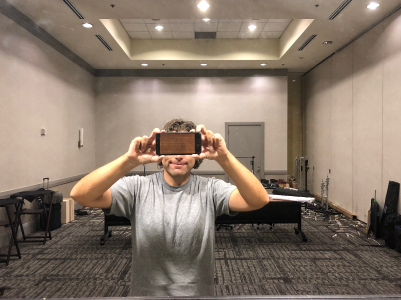 Other times, we have to pack the car (or get on a plane) and bring the studio to them. That’s exactly what we did in October when Todd Lewis from All Things Open reached out to see if we wanted to photograph at their very cool conference. I love doing location shoots but they are are not inexpensive. Aside from the obvious travel costs, we have to rent the space, staff and equipment needed to setup and tear down a mini photo studio. Thankfully, the wonderful folks at Red Hat were keen to sponsor the shoot and bring us out to Raleigh for the conference. 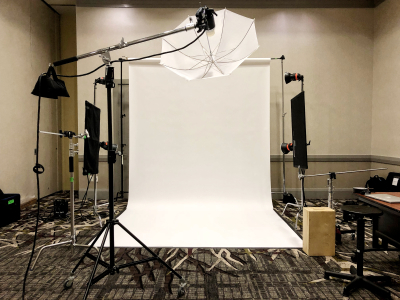 Over the course of three days we turned a blessedly empty hotel conference room into a photo studio where we were able to photograph ten amazing speakers plus one of the seminal figures in the history of open source! Also, while we were in town, Red Hat sponsored a really cool “mini exhibit” of the project where we displayed twenty-five of the photographs on a large, free standing, high resolution, monitor placed in the conference’s exhibit hall. Every time one of the 4,000+ conference attendees passed by the monitor, they learned about a new Face of open source as they made their way to and from sessions and meals. We even had a celebrity sighting! The digital display was a very impactful way to exhibit the photographs. It was also much less expensive than crating and shipping physical prints across the country. I’m excited to use more of these free standing monitors in future conference exhibits. To cap things off, we also did a limited print run of the first Faces of Open Source “magazine” which I signed and gave away to 400 attendees. I love the magazine format and hope to use it to publish new Faces between the larger book releases. I want to give a sincere thank you to everyone involved in making this trip such a success! The team at All Things Open was absolutely wonderful to work with throughout the conference. They really went out of their way to make us feel welcome and fully supported. Also, once again thank you to Red Hat for sponsoring this photo shoot and exhibit. We couldn’t have done it without your support!